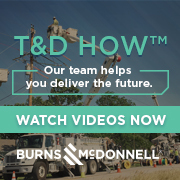 We talked with Ken Gerling, vice president of transmission projects at Burns & McDonnell. During his twenty-five-years at Burns & McDonnell, Ken Gerling has managed transmission projects with capital costs of nearly two billion dollars, and led teams with as many as three hundred and fifty members. Transmission cost allocation when electrons and benefits move in different directions. You’ve heard the old saw, “Costs are assigned to those who caused them.” But what about damage from Superstorm Sandy? Who “caused” that?